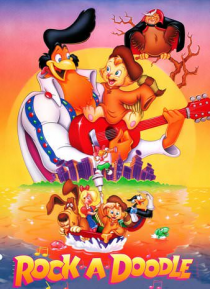 In this animated film, Chanticleer (Glen Campbell), a barnyard rooster, has convinced the other animals that his crowing makes the sun rise. When, one day, he forgets to crow and the sun comes up anyway, the secret is out. He heads for the big city in shame. But as massive storms and dark clouds stop the sun from appearing, the farm animals get worried, so a mouse named Peepers (Sandy Duncan) and … a kitten called Edmond (Toby Scott Granger) lead the gang on a trip to find Chanticleer in the city.